In the first decade of the 21st century, Israel and the US were focused on breaking Syrian influence over Lebanon. The Lebanon civil war and a decade of Israeli occupation left parts of Lebanon in shambles. Syria was asked by the UN to step in and provide security. The Syrian regime and Hezbollah became natural allies and the Saudis tried by subversion to put their hold on the Sunni minority groups in both Lebanon and Syria. The Hariri assassination in 2005 became a rallying call to oust Syria from Lebanon. It didn't stop there. At first the EU and the US (John Kerry) tried to persuade Bashar Assad to reform his authoritarian regime to allow opposition voices be heard and put in place steps for building democracy. The EU offered economic partnerships dependent on political reform. Under President George Bush and Secretary Condoleeza Rice, diplomatic steps were not an option and Syria became an enemy of the US, being an ally of Iran the next target of Israel and US war plans. In early 2011, the so-called Arab Spring and the revolt in Homs, Syria, became an opportunity for regime change and getting rid of the inherent evil dictator Bashar Assad. Taking great pride in the "successes" of Tunisia, Libya amd Egypt, the Western colonial powers and the US united with Turkey, Jordan and the Gulf states to overthrow Assad. The miscalculation would result in a pro-longed civil/sectarian war with over 125,000 persons killed and millions of Syrians uprooted, displaced or crossing borders as refugees. The military stalemate has been reached and the devastation and destruction of Syria is unimagineable. The security for the state of Israel has certainly not improved and may make any peace settlement with the Palestinian people more difficult. Of course, opinion makers in Israel just look forward without remorse to the making of a catastrophy Israel was part of. Even Netanyahu has admitted in secret talks with the Assad regime, Israel was close to a deal for a peaceful settlement and return of (part of) the Golan Heights. Continued below the fold - Israeli opinion today: Saving Bashar Assad. (JPost) - From the first day, the so-called "Arab Spring" was in fact a dark anarchic Islamic winter. Yet, the media has disseminated the idea -- as if the internet, Facebook, and Twitter have produced a new situation in the Middle East: a young Arab generation that adopts Western ideals and yearns for democratic values, civil rights, and freedoms. Unfortunately this was just another wishful thinking, a mirror image, a cultural ignorance even a stupidity. In reality, this dark anarchic Islamic winter symbolizes the demise of the Arab state and the retreat towards primordialism. It is not a step forward towards democracy and open modern societies, but a huge retreat to stagnation and Islamism. The scope and amount of the groups, majority of them are al-Qaida Affiliated groups, is long, exhausting and terrifying. A short list includes the following: Jabhat al-Nusra, the biggest al-Qaida affiliated group; Qatā'ib Ahrār al-Shām; `Usbat Liwā' al-Tawhīd; `Usbab Qatā'ib al-Haqq; Fath al-Islām; Qatā'ib Abdallah Azām; `Usbat al-Ansār; Qatā'ib Shuhadā' al-Barā' Ibn Mālik; Qatā'ib Umar al-Faruq; Jaish al-Islām; Qatā'ib al-Ansār; and al-Majlis al-Thawri. Jabhat al-Tahrīr includes over ten Salafī-Takfīrī sub-groups; and the Islamic State of Iraq and al-Sham, includes the same. Some other groups are organized under al-Jabha al-Islāmiyah; and Ahfād Qatā'ib al-Rasul, with four groups. There are also Jihadi converted Muslims from Europe, Africa, and the US, recruited and organized by Abu Ahmed al-Iraqi. The last estimation by the International Center for the Study of Radicalization in London is that between 3,300 and 11,000 foreigners from 70 nations are fighting now against Assad. Dear brother/ Sheikh Abou Mohamed al-Joulani [reports of his death] and his brothers in the Shura of Jabhat al-Nusra in al-Sham; May Allah protect them. The proponents of Jihad were all dismayed by the dispute that occurred on the media between our beloved brothers in the Islamic state of Iraq and Jabhat al-Nusra in al-Sham. We have neither been asked for authorisation or advice, nor have we been notified of what had occurred between both sides. Regrettably, we have heard the news from the media. At the outset, I have to remind all the Mujahidin and all Muslims of the role played by the Islamic State in Iraq in aborting the crusaders' plot for occupying and splitting the heart of the Islamic world, along with repelling of the elite Rafidhi expansion that aimed at dominating the Levant, Iraq and the Arab Peninsula. I have to remind all the Mujahidin and all Muslims of the job done by our brothers in Jabhat al-Nusra for the people of the Levant in reviving the obligation of Jihad and their revival of the Umma hopes in liberating al-Aqsa and soon reinstating the Khilafa, by the will of Allah. We also praise them for repelling the Batini and secular Rafidhi aggression against the backlog of Islam in our beloved Levant. We also appreciate their praise to their brothers in the Islamic State in Iraq for the support they had offered. For next month #Sochi skiers: a status report by NorthCaucasian Chechen Jihadologists. (Naharnet) - The army communique came after a report that the Honda used in the bombing was stolen in early 2013 from the coastal town of Rmeileh in the Shouf district and then taken to the Palestinian refugee camp of Ain el-Hilweh in the southern city of Sidon. LBCI TV said Saturday that investigators are trying to find out whether the vehicle was kept at the camp or was sold. ... The sources noted that Moussa M. and Mohammed al-Sarii were members of the Fatah al-Islam who receive their orders from the group's top official Haitham al-Shaabi. (NY Times) Dec. 28, 2013 - The explanation was that donors to Hillel do not support J Street, which supports a two-state solution to the Israeli-Palestinian conflict but is critical of Israeli settlement building and the occupation of the West Bank. David Eden, a spokesman at Hillel, said that each of the 550 campus Hillel branches worldwide was independently funded. "But as far as Hillel international is concerned," he said, "J Street and J Street U and other groups are more than welcome." That is what happened at Harvard. Hillel held a dinner with about 15 students for Avraham Burg, a leftist former speaker of the Israeli Parliament. The students then walked over to the Quincy House dormitory for Mr. Burg's speech -- Hillel refused to host the speech because it was co-sponsored by the Palestine Solidarity Committee. Showing documentary films about the Palestinian experience has also caused friction on many campuses. In one case, Benjamin Sheridan, a senior at Binghamton University, part of the State University of New York, said he arranged a showing last year of the Academy Award-nominated film "5 Broken Cameras" and a talk by the filmmaker's brother, a Palestinian angry about the occupation of the West Bank and East Jerusalem. The event was sponsored by Dorm Room Diplomacy, a student group that holds video conferences between American and foreign students. Mr. Sheridan, 21, wears a wristband that says "Israel Is Strong" in Hebrew. He spent his gap year in Israel, has an Israeli flag in his dorm room and did an internship at the American Jewish Committee. May 6, 2013 - Harvard College Progressive Jewish Alliance was not allowed to co-sponsor an event with the Harvard Palestine Solidarity Committee in Hillel. In December, the vice-president of SUNY Binghamton's "Bearcats for Israel" group was asked to resign his Hillel leadership positions after he invited a pro-BDS speaker to campus through a nonpartisan Mideast policy organization, even though he stated repeatedly that he did not agree with the speaker's views. Furthermore, in 2011, Brandeis Jewish Voice for Peace was forbidden from affiliating with Hillel, despite the fact that more than a thousand Brandeis students signed a petition in support of their inclusion. These and similar occurrences have deeply harmed the Jewish community on campus. We are proud of our culture's long tradition of encouraging the expression of multiple, even contradictory, views and arguments; but Hillel's policies have prevented the center for Jewish life on campus from embracing open debate. Pluralism should be extended to the subject of Israel, and no Jewish individual or group should be excluded from the community simply because of political views. The prohibition against anyone who "delegitimizes" or "applies a double standard" to Israel is used to silence students who are critical of Israeli policies or express views with which the Hillel leadership disagrees. These policies deny all students the opportunity to learn about a range of views and form well-supported and defensible opinions about Israel. We all lose out when important perspectives within our community are stifled. Israel loved him for his stance against Iranian diplomacy of President Obama. Now Saudi King Abdullah offers him a gift from the Orient. Saudi Arabia will fund the Lebanese Army with $3bn worth of arms bought in France. Meanwhile, Israel slaps Secretary Kerry in the face who is about to visit Netanyahu and Abbas for the 10th time to stimulate peace talks. Geez, how many times does Prof. Juan Cole need to be told he was wrong in his analysis of the Arab Spring. He bet on the Muslim Brotherhood as champions of democracy after the people's protest. Juan Cole was wrong on Libya, Egypt, now Turkey and the Muslim Brothers' sponsor Qatar. Grabbing the Kirkpatrick storytale for his very own propositions. David D. Kirkpatrick at the New York Times has settled the controversy over events in Benghazi on September 11, 2012, by actually going to Benghazi and digging into the story. Admittedly, it was a somewhat dangerous assignment, but Kirkpatrick risked it. The take-away of this careful investigation, depending on a range of interviews with Libyans who had been at the scene of the attack on the US consulate in the Libyan port city, is that al-Qaeda had nothing to do with it. On the occasion of the appearance of Kirkpatrick's important reportage, I'll leave you with my own deconstruction of the false GOP narrative, from last year. I think it is largely vindicated by what Kirkpatrick was able to find out on the ground. ○ Al Jazeera and Qatar: The Muslim Brothers' Dark Empire? Cross-posted from my diary @BooMan - Bloggers Call BS on NY Times Benghazi Article. Not a bit surprised by these new revelations about the Al Qaeda militants now suspect in the Benghazi raid. Evene earlier NY Times reports clarified the rag-tag Islamist militants with obscure backgrounds the US were supporting in the overthrow of Colonel Gaddafi in 2011. See my earlier statements on Kirkpatrick's NY Times "investigation" - Bloggers Call BS on NY Times Benghazi Article. (AFP/Stuff.nz) - US officials suspect a former Guantanamo Bay detainee played a role in the attack on the American compound in Benghazi, Libya, and are planning to designate the group he leads as a foreign terrorism organisation, according to officials with the plans. Militiamen under the command of Abu Sufian bin Qumu [aka Abu Sufian Hamouda], the leader of Ansar al-Sharia in the Libyan city of Darnah, participated in the attack that killed US Ambassador Christopher Stevens and three other Americans, US officials said. Witnesses have told American officials that Qumu's men were in Benghazi before the attack took place on September 11, 2011, according to the officials. Full story posted as a diary @BooMan - US State Illustrates NYT Kirkpatrick's Fallacy on Benghazi Raid. No one is talking, but it's easy to picture BRICS heavyweights Russia and China casually informing Washington what kind of weaponry and material support they would offer Iran in case of an American attack. Tehran, for its part, would like to interpret the tentative rapprochement as the US renouncing regime change, with Supreme Leader Ayatollah Khamenei paying the price of trading elements of a nuclear program for the end of sanctions. Assuming Tehran and Washington are able to isolate their respective confrontational lobbies - a titanic task - the benefits are self-evident. Tehran wants - and badly needs - investment in its energy industry (at least $200 billion) and other sectors of the economy. Western Big Oil is dying to invest in Iran. The economic opening will inevitably be part of the final agreement - and for Western turbo-capitalism this is a must; a market of 80 million largely well-educated people, with fabulous location, and swimming in oil and gas. What's not to like? Peacemaker or just a trickster? Tehran supports Assad in large part to combat the jihadi virus - incubated by wealthy sponsors in Saudi Arabia and the Gulf. So whatever the spin in Washington, there's no possibility of a serious solution for Syria without involving Iran. The Obama administration now seems to realize that Assad is the least bad among unanimously bad options. Who would have bet on it only three months ago? (CommonDreams) - For months, the "slam-dunk" evidence "proving" Syrian government guilt in the Aug. 21 Sarin attack near Damascus was a "vector analysis" pushed by the New York Times showing where the rockets supposedly were launched. But the Times now grudgingly admits its analysis was flawed. The New York Times has, kind of, admitted that it messed up its big front-page story that used a "vector analysis" to pin the blame for the Aug. 21 Sarin attack on the Syrian-government, an assertion that was treated by Official Washington as the slam-dunk proof that President Bashar al-Assad gassed his own people. The analytical flaws included the fact that one of the two missiles - the one landing in Moadamiya, south of Damascus - had clipped a building during its descent making a precise calculation of its flight path impossible, plus the discovery that the Moadamiya missile contained no Sarin, making its use in the vectoring of two Sarin-laden rockets nonsensical. But the Times' analysis ultimately fell apart amid a consensus among missile experts that the rockets would have had a maximum range of only around three kilometers when the supposed launch site is about 9.5 kilometers from the impact zones in Moadamiya and Zamalka/Ein Tarma, east of Damascus. The Times' front-page "vectoring" article of Sept. 17 had declared: "One annex to the report [by UN inspectors] identified azimuths, or angular measurements, from where rockets had struck, back to their points of origin. When plotted and marked independently on maps by analysts from Human Rights Watch and by The New York Times, the United Nations data from two widely scattered impact sites pointed directly to a Syrian military complex." In Sunday's article - the one below the fold on page 8 - the Times reported that a new analysis by two military experts concluded that the Aug. 21 rockets had a range of about three kilometers, or less than one-third the distance needed to intersect at the Syrian military base northwest of Damascus. The report's authors were Theodore A. Postol, a professor of science, technology and national security policy at the Massachusetts Institute of Technology, and Richard M. Lloyd, an analyst at the military contractor Tesla Laboratories. The Times noted that "the authors said that their findings could help pinpoint accountability for the most lethal chemical warfare attack in decades, but that they also raised questions about the American government's claims about the locations of launching points, and the technical intelligence behind them. ... The analysis could also lead to calls for more transparency from the White House, as Dr. Postol said it undermined the Obama administration's assertions about the rockets' launch points." 'Nuff said - Ariel Sharon. The favorite slogan of President Shimon Peres: "I don't look back." Meaning he never second guesses decision of the past and white-washes all criminal acts. In his last period of his life he hands out and receives decorations and has just one amend to make. Under his watch spy Jonathan Pollard was refused entry at the Israeli Embassy and arrested by the FBI. Peres will do all to get the Pollard's sentence commuted after 28 years. Secretary Kerry is on his mission to the Middle East and I-P negotiations. It would be embarrassing for him to be in Ramallah the moment Palestinians explode with joy as soon as Sharon dies. Perhaps Netanyahu should issue one of his gag orders. It is clear the effort by Kerry has been underestimated in Israel as the MKs and cabinet members unite to block all "concessions" to the Palestinians. Israel wants the status quo of today to be permanent: occupation ad eternae with annexation of East Jerusalem, large settlements and the Jordan Valley. Quite a task for Obama and Kerry in 2014. Israel tries to stall the negotiations to pass beyond the November mid-term elections. Conclusion: As one bulldozer passes away, five others have already taken his place. (Tikun Olam) - Daniel Seaman, one of the Israeli government's ace hasbara flacks has stuck his foot in it again. Earlier today, the Palestinian ambassador to the Czech Republic died when he opened a safe that had remained unopened for thirty years. Apparently, there were explosives inside which exploded. His death was accidental and not the result of a terror attack. In yet another deeply offensive social media gaffe, Seaman published the Facebook post (his account from which the offending post has been scrubbed) displayed here. Note that he placed the word "ambassador" in quotation marks as if to imply that Palestine wasn't a country and couldn't possibly have an ambassador. This coming from an Israeli "diplomat" who serves a government that claims to support a two-state solution. As a Swarthmore alumna, I remember the anti-Zionist bias that permeated student groups in the late 1980s. Israeli speakers were heckled and Zionist students harassed. But I am disheartened by the national Hillel organization's decision to distance itself from events at which Israel's policies are questioned. When Abram Sachar, my grandfather, built Hillel, it was as a place where all Jewish students would feel welcome. My father, the historian Howard Sachar, continued this tradition of inclusion during his years of service to American Jewish campus life. For centuries, the strongest communities of the diaspora have been those that encouraged discussion and debate. Our willingness to engage dissenters rested on logic and morality. I fear that the trend to stifle legitimate criticism of Israel comes from a collective fear: that the occupation of the West Bank has forced Israel and those who unquestioningly support it to cede the moral high ground. For Israel's sake and our own, we must re-embrace the tradition of open discussion of any topic with intellectual rigor. 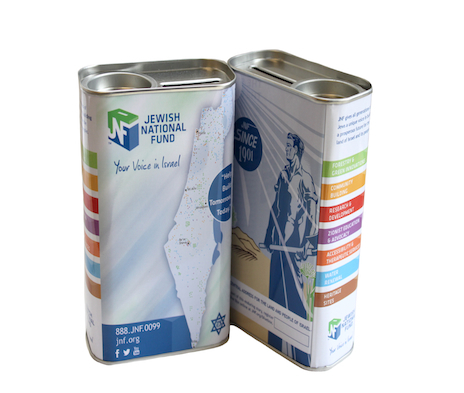 (Forward) - For over 100 years, the Jewish National Fund's iconic little blue donation boxes presented on their tin sides a dream of a Jewish state that spanned, uninterrupted, from the Jordan Valley to the Mediterranean Sea. The Israeli government officially dropped that dream in 2009, when Prime Minister Benjamin Netanyahu announced his support for a two-state solution to the Israeli-Palestinian conflict. The little blue boxes didn't get the memo. 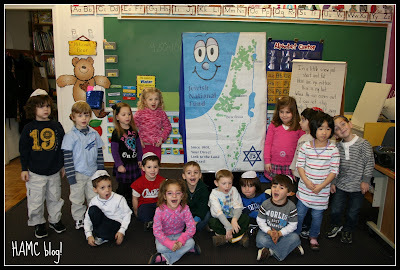 Today, the JNF's coin collection boxes, which sit on tables in Hebrew school classrooms throughout the Jewish Diaspora, are still decorated with a map that depicts Israel without the Green Line that, on most maps, distinguishes Israel from the Palestinian-populated West Bank, which it has occupied since wresting it from Jordan in the 1967 Six Day War. The lack of a Green Line was noted in a December 24 blog post on the anti-Zionist website Mondoweiss. Asked about this, a spokeswoman for JNF denied in an interview with the Forward that the maps on the boxes are maps of Israel. "This doesn't say this is a map of Israel," said Neta Yoffe, JNF's director of communications. "This is a blue box... Nowhere do we talk about it being a map of Israel. We just focus on the wonderful work that we do for the country." Just like sunspots, a 11-year cycle to reach a new max. The debate between parties and the Jewish diaspora is getting very heated as Secretary Kerry puts on pressure and moves forward to the two-state solution for the I-P conflict. The debate has resumed with the Obama presidency from 2009 forward and especially with his election win over Netanyahu's darling Mitt Romney in 2012. For the Palestinians it's clear the Zionist goal is to close the Jerusalem-Jericho corridor with new settlements and make a two-state option void and null. In terms of human life span, this time period is major. In biblical terms, it's a battle to win in a war spanning decades or centuries. For Obama all pieces of the puzzle need to fall in place for the Middle East region. From some googling, the picture has changed over the years. I am trying hard, but I can't remember which design was on my particular blue boxes in late 50′s early sixties. Is there a catalogue or listing of the different designs used anywhere? Three have been mentioned so far, a '47 with Palestine, the Israel map pictured here, and Stan with the ax pictured in Ms. Schulman's article. How many different designs were there? Has anyone collected them all? But yeah, the box is a symbol of decades of diaspora support of Israel. That is the real context. JNF started in 1901 and the blue box of Stan with the ax - see her earlier article. It is hard to pinpoint exactly when it all started. But somehow-during the years of putting my change in the little light blue box next to my bed to pay for trees planted in Israel, years at Zionist summer camp, years of Israeli folk dancing and activism with Hillel in college, years in Jerusalem studying for my Master's degree-it happened. The funds raised through the Blue Box (the "pushke," as it was widely known) were an instrument to redeeming the land in Eretz Israel on which the Jewish home was to arise. But the Blue Box was more than just a fundraising device. From the beginning, it was an important educational vehicle spreading the Zionist word and forging the bond between the Jewish People and their ancient homeland. The Blue Box has changed form many times over the years, and often wasn't even blue. It is a symbol. A symbol of KKL-JNF and its efforts to develop the land of Israel, plant forests, create parks, prepare soil for agriculture and settlement, carve out new roads and build water reservoirs - A symbol of connectedness with the land. For several decades the Blue Box raised funds for environmental goals, though over time its status whittled away until it disappeared from the Israeli scene. The Blue Box was reinstated after the Second Lebanon War. Giant Blue Boxes designed by the finest Israeli artists were exhibited on Tel Aviv's Rothschild Boulevard where the public was invited to contribute to rehabilitating Israel's northern forests which had been destroyed in the war. Isrotel Hotels also took part in the effort with a large donation and awarded a tree planting certificate to every guest in each of its hotels. See the Blue Box Gallery. But the group, which raises $50 million annually through its U.S. fundraising arm, has been at the center of several controversies in recent years. It has drawn attention for its efforts to force Bedouin villages off JNF-owned land, which have resulted in the repeated bulldozing of Bedouin towns. JNF has also drawn criticism for its continued refusal to sell or lease its land to non-Jews, including Arab citizens of Israel. The JNF's blue boxes have long been used as a propaganda tool. In a 2003 article in the academic journal "Israel Studies," Haifa University professor Yoram Bar-Gal reported that the first blue boxes to include maps in their design, produced in 1934, depicted a borderless area that reached from the Mediterranean into Lebanon and Jordan. Bar-Gal wrote that the map's expansive claim was presented on the box in order to "transmit a political message, to which not only adults were exposed, but also the millions of children in the Hebrew educational system, who contributed their coins at special fundraising ceremonies." ... In 2011, JNF board member Seth Morrison announced that he was quitting the group after learning that a subsidiary of the JNF's Israeli organization was evicting Palestinians from homes in East Jerusalem and handing them over to a settler organization. Meanwhile, in the Negev, the Israeli government has demolished the Bedouin village of Al-Arakib dozens of times in an effort to clear JNF-owned land for a JNF forestation project. This effort, part of the JNF's Blueprint Negev initiative, has drawn criticism from U.S. activists. In a statement, the rabbinical human rights group T'ruah condemned JNF. "Ansar Al-Sharia cleans the streets of Benghazi and conducts social work to further enhance its standing"
Security in Libya still remains an ephemeral prospect. The country is awash with guns and militias, numbered in the thousands. Since the collapse of the Gaddafi regime, successive transitional governments have consistently failed to impose their authority over the entirety of its territory and to reverse a deteriorating security climate. An ever-expanding network of rampant militia groups, with varying agendas and scope, is an undeniable obstacle to the country's post-revolutionary stability. They typify Libya's complex tribal, regional and ideological makeup, which Gaddafi held together with an iron fist for four decades. Unable to adequately police Libya's vast desert borders, the militias pose a threat to regional security. Small arms, antiaircraft missiles and rocket propelled grenades in some of the world's largest weapons warehouses are readily available for militant groups, jihadists and violent opportunists, who consider these weapons as an "insurance policy" amidst the reigning anarchy. As a result, the entire Maghreb-Sahel region is vulnerable to cross-border militancy emanating from the Libyan "arms bazaar." More worrying still for Libya's stability is the resurgence of terrorist activity by Al Qaeda in the Islamic Maghreb (AQIM) and its affiliated organisations, such as Ansar Al-Sharia in Libya. Libya is at the cornerstone of AQIM regional strategy. Members of the intelligence community have gone so far as to label Libya, AQIM's "headquarters" in the region. With little to no policing of its vast and porous desert borders, the country is now a launching pad for terrorist operations throughout North Africa and beyond, helping jihadi groups in Tunisia, Algeria and Egypt to organise well-coordinated attacks such as the unprecedented hostage crisis at the In Amenas facility in Southern Algeria. Libya's lawless desert provinces are a haven for weapons trafficking. The vast and unsecured weapons stockpiles, which mushroomed during Libya's eight-month civil war, are at the mercy of Islamist militants with the financial clout to secure them for their fighters. These groups use Libya as a safe-haven, establishing training camps for new recruits. North African and Western would-be jihadists travelling to Syria to join the fight against the Assad regime begin their journey in training camps situated in Libya's central and eastern regions. AQIM's modus operandi in Libya remains largely unclear but its activities in the country follow an all too familiar strategy adopted since the early 2000's, which consists of identifying and occupying spaces beyond the reach or control of central governments. AQIM's ability to infiltrate, fund and persuade armed groups with an Islamic agenda should not be understated. In Mali, the group was able to hijack the Tuareg rebellion through a loose coalition with other local jihadi groups to create a short-lived Islamic state in the country's Northern Azawad region. Cross-posted from my diary @BooMan - Libyan Leader Aims for Separate Cyrenaican State. Juan Cole's abysmal analysis on Benghazi and final Senate report. The professor was wrong on Libya, the "success of our intervention" and mitigated the dangers of the militias in a broken country. Terrible circular reasoning after his previous praise for Kirkpatrick's NY Times article. Now he asserts the NY Times report has all the facts, so the Senate Intelligence Commission report is erroneous. See point 2 and 3 to white-wash the responsibility of Hillary Clinton. Clinton was close to the Muslim Brotherhood, so was JC fond of Qatar, Turkey and Egypt's Morsi. It's time to admit defeat and move on. What really pissed me off, Juan Cole putting blame on Ambassador Stevens with an argument full of holes and hardly part of the essentials in the Benghazi and Libya quest by the State Department during 2011-2012. It's Secretary Clinton who sets policy on our presence in Libya and how to operate the Tripoli embassy and the Benghazi mission. Stevens represented the US as her ambassador, not someone setting policy or where ultimately the buck stops! Cross-posted from my diary @BooMan - Benghazi IC Report: Terror Attack, AQ Links, No Protests. Nice catch, kudos to The Forward. (The Forward) - Chile's El Palestino soccer club recently raised the ire of pro-Israel groups when it decided to redesign its team jerseys, replacing the numeral one with a one-state map of Palestine. Because they show the entire map of Israel as Palestine, these jerseys effectively erase Israel, making it seem like the state doesn't exist. In a blog post last week, I asked how the Simon Wiesenthal Center and Anti-Defamation League can condemn these jerseys for using a one-state map, while staying mum about the fact that the Jewish National Fund does the exact same thing on its charity collection boxes. "There is no comparison between the JNF blue box and the team jerseys worn by Chile's "El Palestino" soccer club. The Chilean team's shirts are a highly politicized form of incitement which negates Israel's existence, while the JNF boxes have a representation of the internationally recognized country of Israel." Huh. It's hard to know how this explanation is supposed to defuse the idea that there's a double standard at work in certain pro-Israel groups when it comes to one-state maps. As far as I can tell, though, three claims are being made here. Let me try to unpack them. If 'Palestine' Jerseys Incite Hatred, What About JNF [Blue Boxes]? I was surprised to read Turkey supported UN Ban Ki-moon's invitation to Iran to attend the Geneva-2 talks in Montreux on January 22. On the other hand, Turkey has turned towards estabishing a working relationship with Iran in recent months. Similar to EU political figures and corporate executives wanting to be partner of the economic boom that is expected as the sanctions are relieved. Iran has been officially invited to participate in the Geneva 2 Syria peace conference on January 22, UN Secretary-General Ban Ki-moon said. The Syrian National Coalition has threatened to withdraw from the talks, unless Iran's invitation is revoked. The UN chief also said that he had assurances from Iran's Foreign Minister Mohammad Javad Zarif that Tehran would play a "constructive role" in solving the crisis in Syria, Reuters reports. "I believe strongly that Iran needs to be part of the solution to the Syrian crisis," Ban told reporters today in New York after discussions with Iranian officials. "Iran said that they are committed to play a very constructive and important and positive role." The US State Department has accepted the invitation of Iran on the condition it expresses "explicit and public support for the full implementation of the Geneva communiqué including the establishment of a transitional governing body by mutual consent with full executive authorities." "If Iran does not fully and publicly accept the Geneva communiqué, the invitation must be rescinded," State Department spokeswoman Jen Psaki said, expressing deep concern about Iran's "contributions to the Assad regime's brutal campaign against its own people." So far, Tehran has not accepted the Geneva 1 declaration in full because it believes creating a transitional government in Syria would exclude any participation of President Bashar Assad from the country's political future. Ban however said he is convinced Iran eventually will accept the Geneva 1 communique. Cross-posted from my diary @BooMan - Three Hopeful Middle East Headlines Today. Bibi is full of it. Hamas has aligned itself with the Muslim Brotherhood as was supportive of and supported by Egypt's former MB president Morsi, Turkey's Erdogan and the emir of Qatar. Hamas is accused of the attack on Egypt's prison in 2011 which released Morsi and fellow MB prisoners. Jihadists of Al Qaeda affiliation have roamed the Sinai for attacks and have been quite successful. Important turnaround with the military takeover in July, AQ terror attacks increased in the Sinai and Egypt has shut down most border tunnels towards Gaza. Last year there was a border attack on Eilat with Katusha rockets and a planned ambush of Israeli troops beaten back. See my diary - Qatar Fail in Arab Spring and Loss to Saudi Diplomacy. (Reuters) Nov. 12, 2013 - In an eight-day conflagration with Israel last November, Islamic Jihad surprised many Palestinians by becoming the first militant group to fire an Iranian-made missile some 70 km (44 miles) up the coast towards Israel's financial hub, Tel Aviv. "Islamic Jihad is dangerous because to a degree it is uncontrollable," said Yoni Fighel, a retired Israeli army colonel and a senior researcher at the International Policy Institute for Counter-Terrorism in Herzliya. Unsettled by the civil war in Syria, Hamas distanced itself from its old allies in Damascus and Tehran. Instead, it rushed to the court of Egypt's new Islamist president, Mohamed Mursi, confident that he would help them consolidate their power. The ousting of Mursi in July and the arrival of a military-backed government in Cairo has turned Hamas's hopes to dust. Like Hamas, Islamic Jihad is a Sunni group, but even as old Sunni-Shi'ite divisions rend the fabric of the Middle East, it has kept close to Shi'ite Iran - and continues to receive Iranian funding put at more than $50 million a year by Israel. Although Islamic Jihad put its name to last November's ceasefire deal, Israeli officials believe that it might strike out again as soon as its arsenal of missiles is replenished. Whether Hamas will also want to reopen the Israel front is debatable and a possible source of future friction. Hamas shares with Islamic Jihad a mistrust of smaller groups in Gaza, some linked to al Qaeda, which take an even harsher line against Israel and Egypt's new anti-Islamist rulers. For now, peace between Hamas and Islamic Jihad holds.